If you have dreams of becoming rich, then play the Cash Splash progressive slot for the chance to win. Cash Splash has two different slots, one with 3 reels and the other with 5 reels. The slot has 15 fixed paylines, Wild and Scatter symbols, and can be played with a minimum of 0.20 coins. This amazing progressive slot features vibrant graphics and high-speed action, ensuring that you are entertained throughout the jackpot madness. Our review we’ll focus on the 5-reel version of the jackpot game which offers the usual 5×3 reel combination. The number of credits you can wager on each pay line and the size of the coin bet is set at one 0.20 per line. So, to make a bet with all possible paylines, the size of the bet will be 3.00 (15 x 0.20). To be frank, Cash Splash is a game that appeals to progressive jackpot seekers who don’t mind spending that kind of money on every spin. If you wish to hunt for the progressive jackpot with smaller bets, there are other games available (eg. Fruit Fiesta slot). 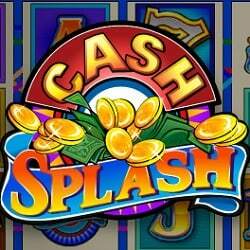 Cash Splash is an online slot with some retro feel. The high symbols are traditional one-armed bandit’s symbols including BARs, 7s, CHERRIES and $ symbols, while the player card low symbols (from “10” to “Ace”) are also available on the reel slots. The high symbols generate winnings from 8 to 800 credits if you land three or more across the reels in a winning payline. As for the low symbols, they offer winnings from 2 to 200 credits for the same. Note, having two jacks or tens across the first two reels on a winning payline is also a winning combination. In addition to these symbols, there are two other icons on the slot reels that gamers will be familiar with. The first of these is the special scatter symbol that triggers extra bonuses. If you have 3 scatters across the reels in any position you will win 4 times your bet. If you have 4 scatters and this generates a 50 multiplayer to your initial stake. Lastly, hit all 5 scatters across the reels and you’ll unlock 250 multiplayer for your original stake. The second special symbol in Cash Splash slot is the Wild symbol. This will substitute any other symbol (except the Scatters) to generate the biggest wins possible. And, when you see 5 Wilds symbols on the reel son any of the first 14 pay lines you’ll win the normal jackpot of 6,000 credits. Lastly, when you manage to land 5 Wild symbols on the Cash Splash slot reels you will take home the biggest progressive jackpot up to any amount!